Here’s links and commentary on recent reading. Social networks can be analyzed along three dimensions of competitive advantage: social capital, utility, and entertainment. A whole class of companies are better understood as Status as a Service (StaaS) businesses. This is especially true of social networks. Status as a Service businesses are best analyzed along dimensions of social capital. All StaaS businesses have their own Proof of Work to enforce scarcity of status. Clever lip synch and dance number on TikTok , short quip on Twitter, beautiful photo on Instagram, insightful answer on Quora, etc. Proof of Work is critical in StaaS business because it defines the scoreboard which users compete on. It separates users by their skill at that Proof of Work and creates a relative status ladder. Early Twitter was a lot of dull life updates (my first tweet was “Doing my taxes”). Then Favstar and Favrd came along and provided a global scoreboard for all to see. This launched comedy Twitter. The entire tone of content on the service changed. The greatest social capital explosion in history was the launch of Facebook’s News Feed. It simultaneously increased efficiency of distribution of posts while pitting all of them against each other in a global, unified status competition. What stuck with me most was how social networks are driven by status seeking through proof of work. This proof of work flywheel keeps all the status-seeking monkeys going. A useful (if perhaps depressing) lens by which to view social media. And the internet more generally. Full post here. Shorter twitter summary here. Superstar niches: In the old model, labels would (and often still do) carpet-bomb TV, radio, print and digital with massive campaigns designed to create global, superstar brands. Now, labels can target more precisely and be selective about what channels they use. Kobalt’s business is based around making its roster superstars within their respective niches, finding a tightly-defined audience and the artists they engage with. The traditional superstar model sees an artist like a Beyoncé, Ed Sheeran or a Taylor Swift being a mass media brand with recognition across geographies and demographics. The new superstar can fly under the radar while simultaneously being hugely successful. This idea of superstar niches harkens back to the now venerable 1000 true fans. But the larger point is “superstar niche” describes not just how music works, but how much of the internet economy works. It’s nearly all superstar niche now. The industrial/mass media age is over. 4. 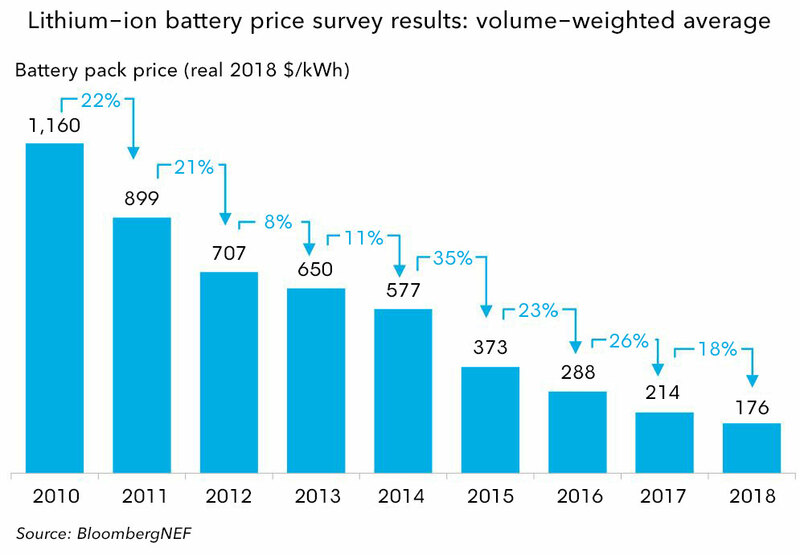 Lithium-ion battery prices are going down. Good news in a single chart. 5. Screen time and mental health. There’s a genre of media story best understood by just reading this title: Have Smartphones Destroyed a Generation? This response from Vox is good: Have smartphones really destroyed a generation? We don’t know. I think a reasonable position right now is not to worry too much. There is a rise is suicide among young people, but it’s hard to know what’s causing it. One caveat is Jonathan Haidt argues “We should all be careful about moral panics over tech, but I have been conducting two semi-open-source lit reviews which, so far, support the claims made in video: rising depression, for girls mostly, and some link to social media” And “It’s not so much screen time for all teens, that is bad; it’s specifically social media for girls.” To the extent we should worry, perhaps that’s where to look. 6. Podcasts. If you’re looking for podcasts, below are good episodes from three podcasts I listen to regularly. a16z – Brian Koppelman interviewed by Marc Andreessen and Sonal Chokshi. Koppelman is the showrunner for the TV show Billions. He draws useful parallels between creating new shows and creating new companies. Manifold – Kaiser Kuo interviewed by Steve Hsu and Corey Washington. Kuo hosts the Sinca podcast, on China. It’s good too. But here they discuss Kuo’s background, which includes a stint playing in a rock band in China, as well as working for Baidu. Conversations with Tyler – Emily Wilson interviewed by Tyler Cowen. Wilson wrote an excellent new translation of Homer’s Odyssey. What’s great about this interview is the evident joy Wilson brings to her work. It made me smile. Here’s links with commentary from recent reading. 1. Notes on the College admissions scandal. The New York Times has a good explainer. The primary ways people cheated on college admissions where: 1) paying someone else to take SAT tests, and 2) bribing coaches to fake sports resumes. The context here is elite colleges face unrelenting pressure to raise their rankings. In practice this makes them lure in max applicants but only accept a flat cap, because lower acceptance rates equate to greater eliteness. But somewhat surprisingly, this pressure also leads to easy grading, with students rarely flunking out. Why? Because if particular demographics of students flunk out, people will suspect unqualified students must have snuck in. This dynamic makes cheating to get into an elite school work. Because once you sneak in, the university doesn’t want you to flunk out, especially if you’re underqualified. Everyone needs to get an A. In terms of commentary, Arnold Kling argues the “fundamental scandal is that elite colleges are a positional good for parents. The whole process is built around that.” That is to say, kids weren’t cheating. Parents were cheating so they could brag to their friends. Often not even telling their kids. Thus the people most outraged are rich parents with elite degrees, who have been grinding their kids down playing by the rules. Kevin Carey points out that statistically elite college degrees tend not to matter very much for the wealthy or those with high test scores, as they’ll get fine salaries either way. It makes the biggest difference for the underprivileged, as an entree into upper class culture, networking and jobs. This is true. But downplays the social status allure of the elite college credential, which drives of the problem. Parents cheat for status, not money. Ross Douthat say many “misunderstand the real function of meritocracy, which is not the facilitation of upward mobility but the legitimation of a ruling class.” That is to say, Harvard’s purpose is not merely to select applicants, but to justify the legitimacy of those who govern. What we’re seeing now in US politics is a breakdown of trust in leadership of our institutions. This breakdown encourages a nihilistic populism. One proposed response to the scandal is to eliminate test scores on applications. Daniel Friedman walks through why this will makes things worse. The easy way to see this is by asking whether it would be easier or harder for wealthy parents to rig the system if they didn’t have to provide test scores. One less thing to lie about. 3. Level 2 self driving is pretty silly. On a related note, the levels getting to self driving cars are defined as: level 0 – manual, level 1 – cruise control, level 2 – partial automation (hands on, may have to take back control), level 3 – eyes off (car can stop if needs help), level 4 – full (doesn’t need help), level 5 – no steering wheel. This is ok except for level 2, which is silly. Why? Because with level 2 you’re supposed to let the car drive but still pay attention and keep your hands on the wheel at all times. But human natures being what it is, when it was tried in 2012 by Google “In-car cameras showed users napping, putting on makeup and fiddling with their phones.” Pretty much. Level 2 shouldn’t exist. Since we’re doing voter surveys. Maybe part of this is the demographics of age. See below. If age is the driver, things will get worse. From America’s Defining Divide Isn’t Left vs. Right. It’s Old vs. Young. 5. New paper on Wigner’s friend quantum mechanics. Ok. If you’re not into foundations of quantum mechanics, skip this and jump to #6 below about Zebra stripes and flies! But if curious, plow ahead. Wigner’s friend is a thought experiment in quantum mechanics. Observer a measures the outcome of a quantum experiment, which collapses the wave function, so observer a records a particular result. Now. If there’s an observer b who watches observer a, what observer b sees is the quantum superposition from the experiment is contagious, in the sense that observer b sees observer a is still in superposition. At least until after observer b does their measurement. This is related to the famous Schrödinger’s cat thought experiment. At a technical level the contradiction between observer a and b manifests as a violation of the Bell inequality. The experiment in the paper did an extended version of Wigner’s friend, with an outside observer c.
6. Zebra stripes discourage biting flies. One longstanding hypothesis (among many) for why Zebras have stripes is to discourage flies. A new paper supports this idea. Apparently flies can see the Zebras, but the stripe pattern makes them struggle to land. Excellent write up by Ed Yong. Plus lovely pic below, dressing up a horse with stripes to test the theory. And that’s all for now. Thanks for reading. Here’s links/commentary on interesting things I’ve read recently on the internet. So what was not said? Answer: money! How will messaging make money without ads? Facebook itself prints money from ads. Instead, the default money making model for messaging is Line in Japan, and WeChat in China. These started as messaging apps but are now complete platforms with payments and mini-apps running inside them. So unless we hear otherwise, that’s the best guess on where Facebook wants to go. While that will be harder to pull off in the US, in many parts of the world Facebook is the internet, so their chances outside the US are higher than within. Furthermore, as Antonio García Martínez showed in his excellent book Chaos Monkeys, Zuckerberg has always disdained grubbing money from ads. Yuck. Dirty. So dirty. Now Zuckerberg can finally funnel his Facebook ad money into the platform he’s always longed to become. The Microsoft of the social networking age. Skimming money off every platform payment transaction, as every good software monopoly’s heart truly desires. Why can Facebook deliver most of the value? Because they are still Facebook! They still have the core Facebook app, Instagram, ‘Like’-buttons scattered across the web — none of that is going away with this announcement. They can very much afford a privacy-centric messaging offering in a way that any would-be challenger could not. Privacy, it turns out, is a competitive advantage for Facebook, not the cudgel the company’s critics hoped it might be…. Relatedly, and most importantly, there needs to be much more appreciation for the anti-competitive trade-offs inherent in an absolutist approach to privacy. Facebook is doing what its fiercest critics supposedly want, and enhancing its competitive position as a result. 2. DNA tests on envelopes and shell casings. If you told me it was possible to track down criminals by picking up DNA from licked envelopes, I’d have paused, but nodded. And perhaps yes, even 100 year old envelopes, sure. Story here. But even though I know it’s a fast moving field, how about this: a lab is able to get “usable DNA off of about 30 percent of the casings it analyzes.” Those are shell casings. From bullets. So the criminal touches the bullets to load the gun, leaving trace DNA. Then shoots the gun, which expels spent shell casings at the crime scene. And 30% of those casings retain enough DNA to identify someone. Wow! Story is here. 4. Small science teams are better, or…maybe not. Bloomberg: Small Groups and Individuals Are More Innovative Than Large Teams. And from Ed Yong at the Atlantic: Small Teams of Scientists Have Fresher Ideas. Both are good write ups of the paper. But then Sean Carroll pointed out “The causal factor doesn’t seem to be size of the collaboration, it’s receiving funding from top agencies!” And “Disruptive science is likely to seem speculative or wrongheaded at first, and agencies don’t like to go for that.” And hence “funding some long-shot ideas is more important than worrying about team size. We need a diversity of funders and approaches, and a willingness to let people chase occasional longshots.” Sean Carroll is right. A good catch, and good correction to the narrative. Diversity of science funding matters more, or at least as much, as team size. 5. Lithium Ion battery prices. The chart below makes me happy. In other words, baby shark. We’re talking baby shark. I can’t recall where I saw it, but someone predicted a dance club in 2040 will play Baby Shark late at night, and all the cool kids will go wild as they recall their misspent kindergarten youth. Asking Alexa to play baby shark over and over and over. Truth. And that’s all this time round. Thanks for reading. 2. Stopping school suspensions backfires. New results from a large scale test of “restorative practices”, which means greatly reducing school suspensions. With a goal of helping minority students. Unfortunately it backfired. The policy disproportionately hurt African American students. The common sense reason is simple. Disruptive kids make it hard to teach. And if you don’t suspend disruptive kids, their behavior hurts at-risk kids the most. Kevin Drum is a supporter. So he says we should “take the results seriously enough to try to figure out how programs like this can be improved. We should give up on them only if we do that and they continue to fail.” If you want a harsher take, go here. For many of us, student debt means delaying — if not entirely forgoing — homeownership, marriage, and parenthood. This new form of social stratification — between those who have student debt, and those who do not — will have ramifications for generations to come. Since 2000, the growth in the wage gap between high school and college graduates has slowed to a halt; 25 percent of college graduates now earn no more than does the average high school graduate. Part of the reason is oversupply. Technology increased the demand for educated workers, but that demand has been consistently outpaced by the number of people — urged on by everyone from teachers to presidents — prepared to meet it. Why do employers demand a degree for jobs that don’t require them? Because they can. If the blog was small, I could easily moderate comments and do it consistently. If I was willing to spend lots of time on moderation, I could manage a large blog with consistent comment policies. If I decided not to worry about consistency, I could manage a large blog without putting a lot of time into comment moderation. 8. NASA’s Mars Opportunity rover is dead. 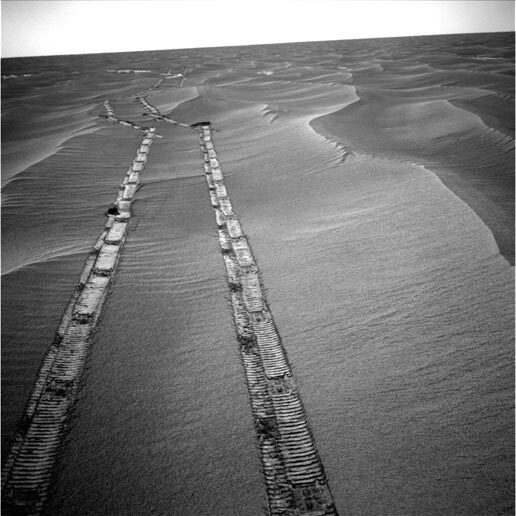 Opportunity had a planned 90 day mission, but lasted 14 years on Mars. Main discoveries were gypsum and hematite, signs of Mars’ far wetter past. My favorite image is below. Here’s a list of links/commentary on what I found interesting this week. 1. European arrival in Americas may have caused enough death to cool climate. When Europeans discovered America in 1492, they brought along smallpox and measles. The resulting mass epidemics killed roughly 90% of the population, dropping from 60 to 5 million. Previously cultivated land, roughly the size of France, became reforested. The new plant growth lowered CO2 levels, cooling the climate. In particular causing the temperature downturn in the 1590s. This idea has been around since 2003. A new paper adds to the argument. It’s a disturbing and headline worthy idea. What’s certain is the mass American dying and resulting reforestation happened. And on the margin this lowered CO2 levels. Fine. What’s less certain is how big this effect was compared to everything else. The paper argues noticeably big. It’s a cool paper. The BBC news story is here. And if interested, read a critique here. 2. All ur DNA r belong to us. In April last year the police solved a murder cold case by searching GEDmatch, a public DNA database. They only found 3rd and 4th cousins, but that was enough to narrow the search to 1000 people. And from there they eventually solved the murder. GEDmatch has about a million people in it. It’s open source, in the sense that people who upload their DNA have agreed to allow anyone else to use it. What’s new is Family Tree DNA, a consumer DNA testing company, with 2 million DNA profiles on file, has been allowing the FBI use their DNA database to find criminals. And they did this without informing their users until Buzzfeed broke the story. People are rightfully upset. This is a breach of privacy and terms of service. That said, as we saw in the GEDmatch case, the public seems generally supportive of using DNA to identify criminals. So I don’t think things won’t go back to how they were. People believe their own DNA is private. But even though only 3% of your DNA is shared by 2nd cousins, that’s enough to identify your pedigree. And even 3rd or 4th cousins are enough to find you if the FBI is motivated enough. Given shared ancestry, DNA information is far more of public good than most naively assume. All ur DNA r belong to us. Of course this means foreign governments can use DNA to track down relatives of dissidents, and tabloids can use DNA to snoop on celebrities. So which justifications for a search are legally allowed matters. But the larger point is we’re not heading toward a world where anyone can be tracked by their DNA. We live in such a world already. 3. Jay Rosen is worried journalism for the 2020 presidential election will be like 2016. Here’s Rosen: “it’s become clearer and clearer to me that, without intervention, coverage of the 2020 campaign is likely to be a disaster for everyone except Trump and his core voters, who want to watch it all burn anyway.” It’s hard to know what’ll happen in 2020 given how much is in flux now. But agree the dynamics around journalism and Trump are unchanged from 2016. Rosen says journalists should spend less time on horse race journalism, pumping out articles on who’s ahead and who’s behind, and spend more time focusing on issues voters care about. We’ll see. Twitter thread is here, and interview is here. 4. Gum Disease and Alzheimer’s. The more sensational version of the news was We may finally know what causes Alzheimer’s – and how to stop it. (Answer: bacteria behind gum disease). This was then countered by No, we don’t know that gum disease causes Alzheimer’s. With the subtitle “A new study suggests a link between oral bacteria and Alzheimer’s, but it’s far from proven.” Which is the correct take. As for me, am I flossing more often now? Yes. Yes I am. 6. Aphantasia, I have it. Aphantasia is an inability to visualize images in your mind’s eye. So imagine an apple. Close your eyes and see it. If you have aphantasia, you can’t do that. There are matters of degree. Some people can vividly imagine pictures. Others less clearly. But if you can’t to it at all you have aphantasia. It was a shock a few years back to read about it because, having aphantasia my whole life, I had always assumed everyone was like me, and “mind’s eye” was just a metaphor. If you’re curious, this account of how shocking it was to find out about aphantasia was similar to my own. Oh. I see. I see! So that’s why book authors waste so much time on elaborate visual descriptions of the countryside. Who knew? Remembering faces is a bit harder for me than most. I can’t visualize, but if I make an effort, or just see someone often that’s fine. GPS is a godsend. My kids sometimes complain I use it for places we’ve been many times, but I love it. And my case is relatively mild. If I focus hard I can sometimes sort of imagine seeing a picture. But it’s rarely worth the bother. I suppose this is neither here nor there. But perhaps I wanted to share because it made me realize we can go through life assuming too much. Leading separate lives, we but dimly perceive our own mind’s eye. Best to reach out and share and learn from others, letting their outside views make us see more fully a complicated, if occasionally beautiful, world. 1. Scott Alexander on cognition models. Reading the book On Intelligence by Jeff Hawkins when it came out in 2004 was a revelation to me. That’s because Hawkins provided an overarching theory for how cognition works, with his memory/prediction model. From page 99: “The recalled memory is compared with the sensory input stream. It both ‘fills in’ the current input and predicts what will be seen next. By comparing the actual sensory input with recalled memory, the animal not only understands where it is but can see into the future.” Reading this in 2019, it seems unsurprising. And the framework is not original to Hawkins. But it was the first time I’d encountered a well written, convincing and unified framework for human cognition. Mind is prediction. At a base level, sense data constantly flows in, and predicted future sense data constantly flows out. At a higher level, mind is prediction on how potential possible actions can affect the world. An overarching framework is critical for science, because it stops you from drowning in details. It’s like completing the outside edge of a puzzle. Once that’s done, the frame guides you on where to place all the other pieces. All of these are examples of interpreting the world through a combination of pre-existing ideas what the world should be like (first column), plus actually experiencing the world (last column). All of these domains share an idea that the interaction between facts and theories is bidirectional. Your facts may eventually determine what theory you have. But your theory also determines what facts you see and notice. Nor do contradictory facts immediately change a theory. The process of theory change is complicated, fiercely resisted by hard-to-describe factors, and based on some sort of idea of global tension that can’t be directly reduced to any specific contradiction. Why do all of these areas share this same structure? I think because it’s built into basic algorithms that the brain uses for almost everything (see the Psychology and Neuroscience links above). And that in turn is because it’s just factually the most effective way to do epistemology, a little like asking “why does so much cryptography use prime numbers”. Last point. The full title of Hawkins’ book is On Intelligence: How a New Understanding of the Brain Will Lead to the Creation of Truly Intelligent Machines. That is to say, we could add a new row to Alexander’s table for artificial intelligence. It slots in perfectly. (And yes, I’m aware some would consider today’s AI a subfield of Bayesian stats). We’re still a long way from general AI. But the point here is the framework to judge AI progress already exists. If mind is prediction from sensory streams, generalized mind (AGI) requires an ability to go beyond narrowly specific domains. A straight line can be drawn from statements like these and the great terrors imposed upon captive populations by Marxist dictators like Stalin, Mao, and Pol Pot. Men like Stalin did not oppose freedom of expression simply because it threatened their personal power. They opposed freedom of expression because they earnestly believed it was a pointless exercise. There is no point in debating with representatives of the bourgeoisie when the ideas of the bourgeoisie were not pliable to debate. If the opposing stance was not the product of reason, it could not be undone by reason. The central proposition of signalling theory is that the vast majority of arguments made in the public sphere are not made in good faith. An outraged tweet is not written to express genuine emotion, but to signal solidarity with the ‘right’ side. A verbose blog post is not written to persuade its readers of its argument, but of the cleverness of it author. A well circulated censure of some racist act is not written to convict the racist, but to display the Wokeness of the censor. The connecting string in all of these cases is that your arguments are less about your ideas than shaping other people’s perceptions of you. Whether you believe you are writing primarily to shape other people’s perceptions of you is immaterial. As with the Marxist theorists, signalling theorists are happy to conclude that signalling does not need to be a fully conscious process. In place of a class consciousness imposed by the material circumstances of an individual’s social status, signalling theorists trace the origins of self-interested arguments to mental social-status ‘modules’ imposed by the material circumstances of an individual’s evolutionary heritage. Civilized discourse depends very much on both parties in duel of words recognizing the self-serving intentions that lie behind the other party’s speech… and then deciding not to mention them. This is Reason’s Pact: the bare minimum required for fruitful rational discourse to take place. We underestimate how many institutions in our society depend on us maintaining this illusion. Jettison the ideal of ‘reason’ as a governing principle, and all you have left are words as war. One quibble. Greer notes “Robin Hanson, doyen of modern signalling studies, fights a perpetual battle to convince his readers that none of the ulterior motives he ascribes to human sociality writ large are behind his twitter polls.” Fair point on the irony of Hanson being attacked for impure motives and signalling. But I would add in Hanson’s defense, I’ve not seen Hanson use that style of argument against his accusers. See this example. In fact the central argument of Hanson’s book on signalling is social policy could be improved if we take signalling into account. That is to say, I read Hanson as a nerdish theorist who writes about signalling with the hope of finding ways to work around it, leading to better social policies. Though perhaps that doesn’t matter. It’s being weaponized regardless. Quibble aside, an outstanding post. Worth reading in full. 3. No One Is Prepared for Hagfish Slime. It’s yucky. Has a great picture of a slime-covered Prius. And is written by the excellent Ed Yong. Recommended. 5. Screentime worries overblown. New paper with N=355,358 argues that screen time worries are overblown, if hard to pin down. The effect of wearing glasses is bigger. Paper here. News article here. And that’s all for this post. Thanks for your time! 1. Roger Penrose on the gravitization of quantum mechanics. Physicist Roger Penrose was on Sean Carroll’s podcast (recommended). I want to highlight a particular point Penrose made at the 1:16 mark. As you may know, the theories of gravity and quantum mechanics are not reconciled. The problem is general relativity (gravity) treats space as continuous, not quantized. While quantum theory makes all interaction quantized. One approach is to reformulate gravity to match quantum mechanics. This approach is called quantizing gravity. String theory is an example. Testing String theory (unless an indirect method is discovered) requires getting down to the Planck scale (very tiny, meaning super energetic particles). As Penrose put it on the podcast, it would require a particle accelerator the size of the solar system. Indeed. Penrose argues we should go the other way around. Rather than reformulate gravity to match quantum mechanics, reformulate quantum mechanics to match gravity. This approach is call the gravitization of quantum mechanics (see paper). Penrose said testing this is just about within experimental reach now, using bose einstein condensates. So what’s the point here? Funding, funding, funding! The world’s largest particle accelerator is the Large Hadron Collider (LHC) at CERN. CERN has just announced a proposal for an even larger collider, at the cost between €9 and €21 billion. Sabine Hossenfelder argues “it would make more sense to put particle physics on a pause and reconsider it in, say, 20 years to see whether the situation has changed, either because new technologies have become available or because more concrete predictions for new physics have been made.” Exactly so. I have no idea if Penrose’s ideas on the gravitization of quantum mechanics will pan out, but at least we can test them for way less than €9 billion. The reason that letting the audience choose its own story keeps failing when the entertainment industry tries it is that it’s a bad idea. It’s the author’s job to write the story. They can then choose a way to convey that story that gives the reader freedom in how they experience it. But if the story itself is merely a loose collection of different options, each in a different genre and with a completely different tone, then what they’ve created isn’t a coherent work, but a self-indulgent mess—like “Bandersnatch”, in fact. The information balance of power has changed, of course. A generation ago, the public could exist only as a passive audience Information was dispensed on the industrial model: top down and one to many. That was the great age of the daily newspaper and famous anchormen on the model of Walter Cronkite. The advent of digital platforms, in a sense, created the public. People from nowhere, free of institutional entanglements, pushed the elites out of the strategic heights of the information sphere. Almost immediately, great institutions in every domain of human activity began to bleed authority a process that, as we have seen, in now approaching the terminal stage for many of them. That is my thesis for the revolt of the public. 5. Telecoms companies sell user data to third parties. While many are upset about Facebook privacy, telecom companies are worse. If you care about this kind of thing, this article title says it all: I Gave a Bounty Hunter $300. Then He Located Our Phone. Lambda School gives students three payment options. They can either pay $20,000 upfront, pay $10,000 upfront and forgo 17 percent of their salary for a year (with the maximum payment capped at $15,000) or pay zero dollars upfront and forgo 17 percent of their salary for two years (with the maximum payment capped at $30,000). Allred estimates that more than 90 percent of students have opted to pay via an income share agreement. It’s easy to dismiss this as no big deal. Why would paying before versus after graduation matter? And the New York Times piece is full of hype. But if you believe incentives are critical to making an organization perform, you can see why colleges getting paid depending on someone’s post college job success could be transformational. Incentives are critical. For example see Austen Allred talking about how the school is helping disadvantaged kids do better at job search. On the flip side, I think there’s also an incentive not to get students enrolled in programs where there’s no chance they’ll graduate. That seems harsh, but the current incentives are to enroll and accumulate debt, which is worse. Better to align all students to the programs that will help their careers the most, rather than over promise. Aligned incentives are great! Here’s my weekly list of links with commentary, the first for 2019. Smith’s post is here. Plus also see his related post Saving the Planet Doesn’t Mean Killing Economic Growth. Look at France and Germany, the two biggest economies in Europe. France has 92% of its electricity from zero emission sources – Germany has 46%. And yet France pays half as much for electricity as Germany because it depends heavily on nuclear and Germany is phasing it out. Germany saw its electricity prices rise 50% over the last 15 years. France’s prices has stayed stable. So introducing huge amounts of solar and wind onto the grid makes electricity expensive; we see it all over the world. The reason has to do with trying to manage all of that unreliability. Christopher Mims. Where You Should Move to Make the Most Money: America’s Superstar Cities. A tech-driven concentration of talent since the 1980s has helped the rich get richer. But it has also sharpened an urban-rural divide that, some say, threatens growth. Timothy Taylor Snapshorts of falling mobility. Has some nice graphs. Matt Yglesias A bold vision for denser construction, this time with more tenant protections. On California bill SB-50. 5. US murder rate decline. The chart below speaks for itself. New York Time article with chart is here. Plus a nice tweetstorm by Noah Smith on same topic. 6. Some good longreads. I’d like to link to some longer articles which I enjoyed reading over the holidays. I’ll comment on why I thought each one might be worth your time. And that’s all for this week. Hope you have a great 2019. I accidentally published this post yesterday with no content. Just a blank post. Sorry about that. Below is the real thing. 1. US-China, begun the cold war has. The Cold War between the US and Soviet Union ran from 1945-1990. With the arrest of the chief financial officer of Huawei (maker of networking and mobile equipment), exports of the opioid fentanyl, and longstanding accusations of theft of tech IP, it seems like the US is headed toward a cold war with China. In most European capitals, policymakers and the chattering classes want to believe that before too long, Mr. Trump will be gone and the world order — including the close alliances between Europe and the United States — will return. But here’s the dirty secret that I learned in my three months in Washington: That’s not true. The Trump moment in the end may resemble the Truman moment, when over a short period America dramatically changed its views of the world. This may be hard for Europeans to swallow, but it’s the message I am bringing back with me from Washington. The post-Trump world will not be the pre-Trump world. Mr. Trump’s presidency has ushered in two significant changes that are likely to have staying power. First, with his administration, Americans have lost confidence in their exceptionalism. Second, under the Trump presidency, rivalry with China has become the organizing principle of American foreign policy. Republicans and Democrats disagree on almost everything today, but one area where there seems to be effective bipartisanship is that America must change its policy toward China. Like it or not, the United States is the global hegemon. In my view this is an overall positive, but for our purposes today let’s just take it as given. What really solidified my views is Peter Turchin’s books, such as Ultrasociety: How 10,000 Years of War Made Humans the Greatest Cooperators on Earth. Turchin argues human society at mass scale came about through the crucible of war. War forged cooperation within large polities, as do or die against foreign threat. External enemies and internal cohesion are two sides of the same coin. Viewed in this light, the second world war and the subsequent cold war were secret drivers of US cohesion during the latter half of the twentieth century. Which means it’s not social media, Facebook, Trump, the internet, or Russia that’s to blame for our recent outburst of tribal conflict. It’s merely a return to normalcy, after the collapse of our previous enemy the Soviet Union. Perhaps the lesson here is not to pretend we can achieve a world with no external enemies. Else things fall apart; the centre cannot hold. Human cooperation within requires an external enemy without. If so, the goal should be to keep those inevitable rivalries in check. Avoid hot war. Avoid brinkmanship like the Cuban Missile Crisis. Instead, the best we can hope for is to be like rival sports teams who (mostly) play by the rules. After each round we shake hands and say “good game my friend, good game”. 2. Moving to superstar cities. Below is a chart of the number of people moving per year (blue bars), and the mover rate (black line). Notice the downward trend of the black line. The mover rate was 20% in 1948, declining to 10% in 2018. Christopher Mims argues that “Technology is creating an economy in which superstar employees work for superstar firms that gather them into superstar cities, leading to a stark geographic concentration of wealth unlike any seen in the past century.” The solution is to have people move to these superstar cities. The problem is housing costs have skyrocketed in these same cities, which means only superstar employees can move there. So we should do more of what Minneapolis just did, remove zoning barriers to cheaper housing in superstar cities. This idea of housing restriction as bad and divisive policy seems to be slowly gaining ground over the past few years. Along these lines, also see these two recent articles: 1) How rising rents contribute to homelessness, 2) Benefits of upzoning near transit and jobs. And that’s all for today. Thank you for your time! Here’s what I’ve read recently that’s worth linking and commenting on. 1. Is bitcoin a scam, a bubble, or a (nascent) platform? I’d answer yes, partial yes, and a maybe. Let’s go one at a time. First up: scam. Kevin Drum argues Bitcoin Is a Long Con Aimed at Those Least Able to Afford It. Quote: “As near as I can tell, the Bitcoin market is split between cutthroat Chinese miners running huge racks of servers, and hopeful but clueless marks who would be better off putting their money into lottery tickets. So this is the test: Are you a cutthroat Chinese miner running huge racks of servers? No? Then you’re one of the clueless marks. Sorry.” The data here is clear enough, with a study finding 80% of ICO offerings in 2017 were scams. One of the most famous being Centra, where music producer DJ Khaled and boxer Floyd Mayweather Jr had to pay fines to the SEC. I disagree with Kevin Drum that bitcoin is only a scams. But the answer is yes, there are plenty of bitcoin/ICO scams. Second up: bubble. Below are two charts which I created using blockchain.com. The first gives bitcoin value with a linear scale. The second uses log scale, which makes it easier to spot bubbles. Formally, an asset bubble is just a rapid rise and abrupt crash in prices. Defenders of the efficient-market theory argue that these price movements are based on changes in investor’s beliefs about an asset’s true value. But it’s hard to identify a reason why any rational investor would have so abruptly revised her assessment of the long-term earnings power of companies in 1929, or the long-term viability of dot-com startups in 2000, or the long-term value of housing in 2007. His [Smith’s] main piece of evidence is that the price rose sharply and then fell sharply. But that sort of price pattern also occurs in 100% efficient markets that are highly volatile because the fundamental value of the asset is hard to ascertain. And if there ever was an asset with a value that is difficult to ascertain, it’s Bitcoin. I have no clue as to what Bitcoin should be worth, and I doubt anyone else does either. Bubble theories are only true if they are useful, and they are not useful. The people who said it was a bubble at $30 were implicitly giving you advice not to buy. Ditto for those who said it was a bubble at $300. This advice was exceedingly non-useful; in fact if you followed the advice of bubble proponents you missed out on the opportunity to earn a massive profit investing in Bitcoin. That’s why I don’t follow the advice of bubble theorists; it’s not useful. BTW, I don’t own Bitcoin for unrelated reason; I prefer index stock (or bond) funds. I happen to believe Smith and Sumner are both correct, with their disagreement being (mostly) semantic. Let me explain. Sumner argues declaring bubble offers no predictive value. You can’t make money from it. Bitcoin bubble has been declared again and again. Are the bubble declarer’s now rich? Nope. He hates the term bubble. Price volatility by itself doesn’t prove bubble. Some assets are just hard to price. I believe Smith would concede the point about predictive value. Smith’s additional point is bitcoin prices were driven by irrational emotion and momentum. And here I think Sumner would concede (though he’d argue all prices work more or less that way). So in the end whether to declare bubble is semantic. It’s a no from a “true value” point of view, since true value pricing of bitcoin is impossible for the present. But a yes from what’s driving the emotion and volatility (and yes scams). I’d lean toward a yes. Third: bitcoin as nascent platform. Chris Dixon has been one the most articulate advocates of blockchain as platform. I’d paraphrase him as saying early in a platform lifecycle, things decentralize. Think early PC era against IBM. But later things get recentralized, for example the late Microsoft PC era. Then came the early internet decentralization. Followed by the Google/Amazon/Facebook/Apple recentralization. So what’s next for decentralizing? Dixon believes it’s blockchain. See his post here, or this recent interview. Unfortunately a historical analogy isn’t proof. In particular one problem jumps out. Is this new platform ready to go right now? Or is it too early (the bane of all tech investors)? To see what I mean, compare this list of too early versus timed correctly: Apple newton v iPhone, Segway v electric scooters, Webvan v FreshDirect, Flooz v well…bitcoin, google glass v whenever AR glasses finally take off. You get the idea. Crypto currencies may become the next decentralizing platform, but it’s far less clear that’s happening now. For example: Out of 43 Blockchain Startups, Zero Have Delivered Products. It’s possible we’ll need another tech generation before things are ready. To sum up. There are plenty of bitcoin scams, but don’t go overboard and say it’s a scam for VCs to make crypto investments. Bitcoin is bubbly, but be careful how you argue. As for blockchain as a decentralizing platform, timing is everything. Which means….maybe. 2. Waymo’s driverless cars not so ready to go. Announced as ready to roll out in December, the roll out happened, and….pretty quiet. From Timothy B. Lee: “It now looks to me like Waymo is nowhere close to ready for fully driverless operation in its initial <100 square mile service area, to say nothing of the rest of the Phoenix metro or other cities.” Also: “This means I have no idea how long it will take for Waymo (or anyone else) to reach full autonomy. It could take six months or it could take six years. Maybe Waymo will be forced to throw out big chunks of what they’ve built so far and start over.” Waymo (sister company to Google) is perceived as farther ahead than anyone else. So if they’re not ready, unlikely anyone else is either. This, then, is the state of technology in 2018: the enterprise market is thriving, and the consumer market is stagnant, dominated by the “innovations” that a few large behemoths deign to develop for consumers (probably by ripping off a smaller company). Meanwhile a backlash is brewing on both sides of the political spectrum, but with no immediately viable outlet through competition or antitrust action, the politics surrounding technology simply becomes ever more rancid. 4. Lyft continues gaining on Uber. Uber had 92% US market share in Feb 2015, 75% in Oct 2017, 69% in Oct 2018. Lyft went from 7% Feb 2015, to 25% in Oct 2017, to 28% in Oct 2018. Nice chart in the article. Both companies are going public in first quarter of 2019. More here. 5. Visualizing population density as 3D. An excellent data visualization. Population density as elevation, making big cities very spikey. If you click through, don’t miss zooming out from cities (starting with Paris) by scrolling right. Enjoyed this quite a bit. Recommended. And that’s all for today. Thank you for reading.